Back in late Septemeber 2011 Facebook announced Timeline, a story of your life for users and it was only a matter of time that this would be introduced for Fan Pages. Last week admins of Fan pages will have recieved notice that pages will be switched to Timeline style March 30th 2011, giving most business the best part of a month to prepare. 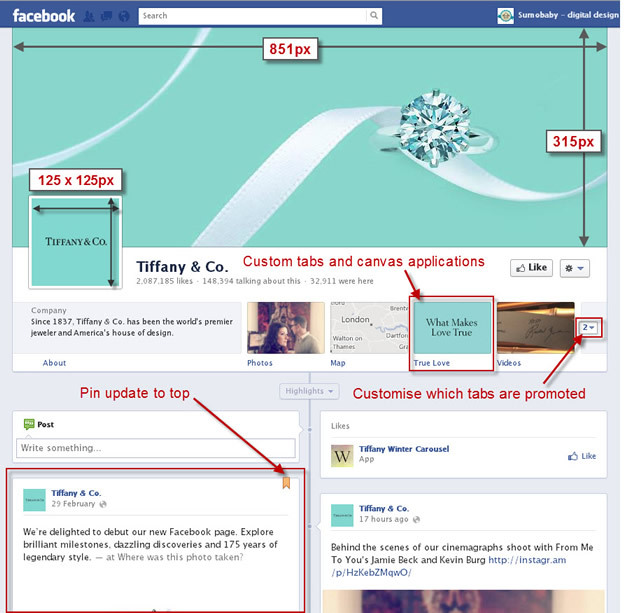 Beneath you will see the key features illustrated using the Tiffany fan page. The biggest change that will have many businesses up in arms is losing the ability to assign a custom tab to be the default view. Often used to encourage people to “Like” a Fan page or for other marketing puposes this has now taken a back seat. You can choose to promote custom tabs/applications just below your cover photo but you cannot set a custom tab. Width has increased from 520px to 810px (although an existing bug may only display 780px). This large 851px x 315px banner is quite different to the previous Skyscrapper style picture fan pages had in the left hand column. Although this is 125px x 125px at time of writing you still need to upload images of 180px x 180px. You can now choose to highlight posts in your timeline which will have those posts take up the full width of your timeline or “pin” a sticky post to the top of your timeline. Facebook have introduced the ability to receive private messages from your fans just in case you wanted/needed to speak with only one of your fans. As for landing pages, you can always copy the link of your old landing page (in my case, the welcome page) and post it as a link to your facebook logo on your website if that is where most of your facebook visitors come from. It’s not a perfect fit, but it could be a temporary workaround. This is certainly one creative solution with the expectancy that most people will visit ones Facebook fan page from a link on you own site. Great workaround as you say. In the links on your Facebook canvas page I would advise you add the target attribute to open your site in either a new window or to target the parent so your pages do not open in the contrained iframe on Facebook itself.